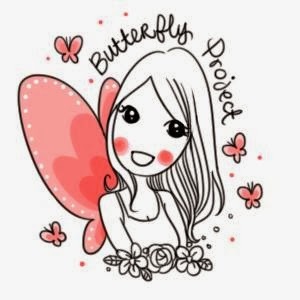 Being in Malaysia, the hot climate can sometimes prove unbearable, and even the most seasoned Malaysians will complain of the heat. But even then, Celebrity Fitness Malaysia proves that the hot Malaysian heat is no excuse to keep you from exercising! 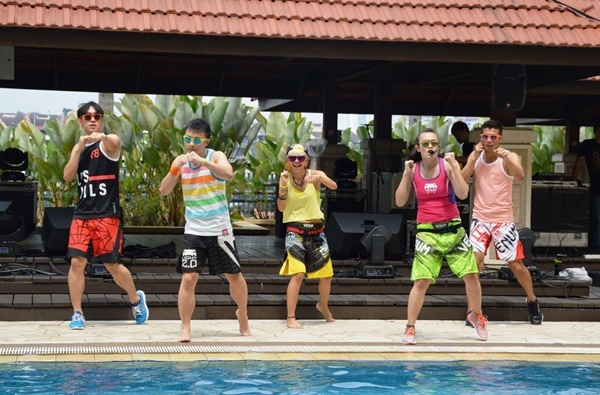 In line with their philosophy to make fitness fun, Celebrity Fitness Malaysia recently held a pool party to introduce aqua based workouts as an enjoyable and beneficial twist to the daily workout routine. Being an ex national swimmer myself, I know all too well that Aqua-based workouts engage all the core muscles, arms and legs. The best part about it? the cool water cools your body down and its buoyancy allows you to reach a greater range of motion and lowers the risk of injury, making water workouts suitable for everyone. As the water reduces the shock impact that normal high intensity exercises have, these absorb the force of gravity. Everyone can try out water workouts, especially those who are recovering from injury or have conditions that would prevent them from exercising otherwise, such as arthritis, back pain or obesity. “While water workouts are easier on your joints, it can actually be more effective than land-based exercises. In fact, water workouts work your muscles harder because you have the added force of water resistance, burning fat and toning up faster,” explained Kris Malhotra, Country Group Fitness Manager of Celebrity Fitness Malaysia. The day-long event is open to all Celebrity Fitness members and their guests who registered for the event, and there were almost 100 people that jumped in the pool for a heart pumping three hour back to back workout featuring Aqua Zumba, Aqua Yoga and Aqua Combat. 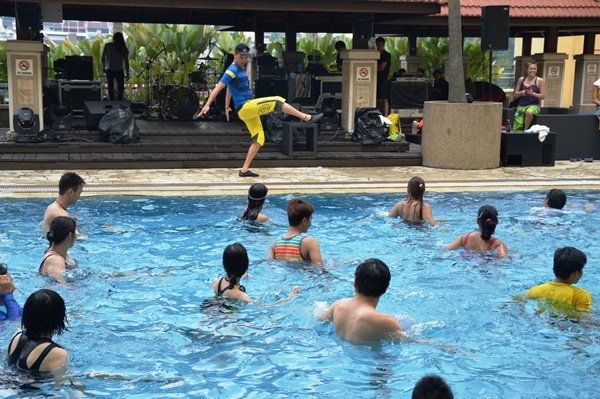 Attendants worked and splashed their way through the high intensity martial arts inspired Aqua Combat, before cooling down with Aqua Yoga and bringing the dance floor into the pool with Aqua Zumba. I think the best part about the entire event was the pool party that happened at the end of the day, where celebrities and guests enjoyed themselves in a two hour dance party led by the Celebrity Fitness Group Fitness team with dance styles such as DNA Flavor, Ritmo Zum and Kukuwa. During the pool party, everyone was treated to performances by Malaysia’s own modern rock band Mad August. 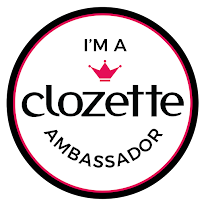 “Celebrity Fitness was recently recognised by the Malaysia Book of Records as the first fitness facility to offer Aqua Zumba classes in Malaysia, and what better way to celebrate this achievement than by once again sharing the joy of keeping fit with our members and guests. 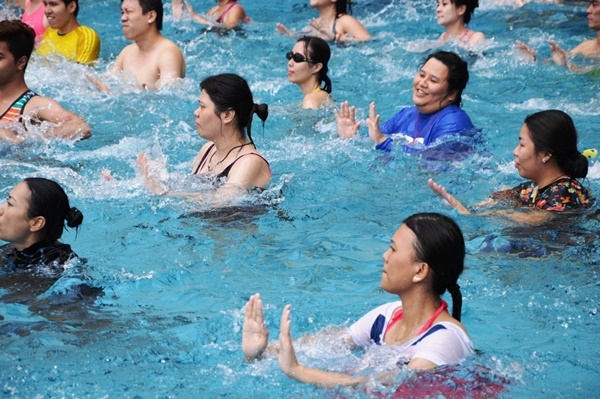 We hope Malaysians will slowly introduce aqua workouts into their routines and enjoy themselves while doing so,” said Mr Ryan Cheal, Vice President of Celebrity Fitness Malaysia. The Wet and Wild party was made possible with the support of Gintell, Crocs, One2Juice, Holiday Villa, Tiger Radler, Smirnoff Ice, Breakout and HUIOS F&B. So who wants to go for Aqua Zumba with me?